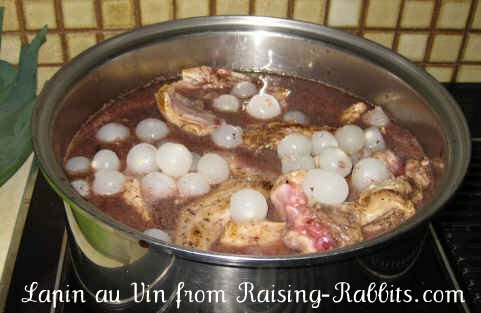 Called Lapin au Vin, this Rabbit in Wine Recipe is at the very top of our family's favorite recipe list. Fry bacon until crisp. Remove from frying pan, drain and crumble. Cook lapin (rabbit pieces) in the bacon fat on medium heat until light brown, about 5 minutes each side. Move lapin into a 4 quart dutch oven. Stir in crumbled bacon, wine, chicken broth, ketchup, thyme, S&P and garlic. Heat to boiling; reduce heat. Cover and simmer until the thickest pieces are done, approximately 40-45 minutes. Shake water and flour in a tightly covered container; gradually stir into broth. Heat to boiling, stirring constantly. Boil and stir 1 minute. Stir in onions and mushrooms. Heat to boiling - approximately 2 minutes. Serve over a bed of buttered rice, noodles or potatoes. Rabbit is a low-cholesterol, very low-fat meat. (Click here to learn about the cholesterol myth). 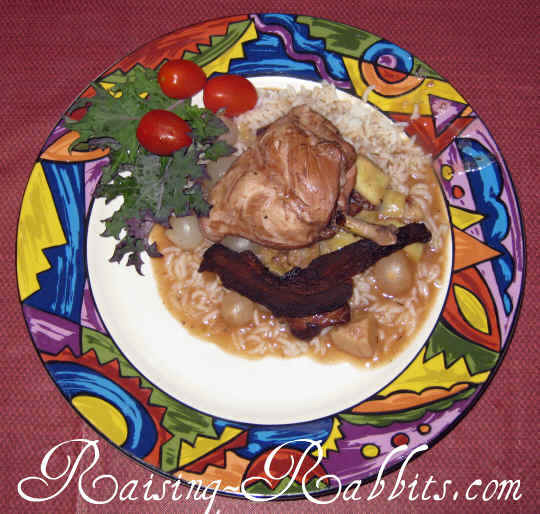 Rabbit is so low-fat, that unless you are cooking older stewer/broiler rabbits, it is likely you will find nearly no fat at all on top of the rabbit in wine recipe broth. 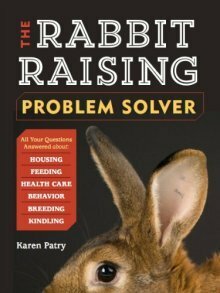 Low fat is not necessarily a good thing - see Rabbit Starvation. A certain amount of fat is essential for flavor and for the proper function of the human body. This is why we rarely remove any fat from the recipe, and indeed, we like to butter the accompanying rice, potatoes or noodles before serving, less for taste (this recipe is wonderful without butter!) but because the added fat helps maintain health and steady blood sugars.